As I’m sure you are now aware, I love all things crafty and am happy to try my hand at most things. A few weeks ago I was asked to help make a Wedding Cake for some good friends. Well it was a challenge, I can tell you! We had less than 4 weeks and the couple didn’t know what they wanted. 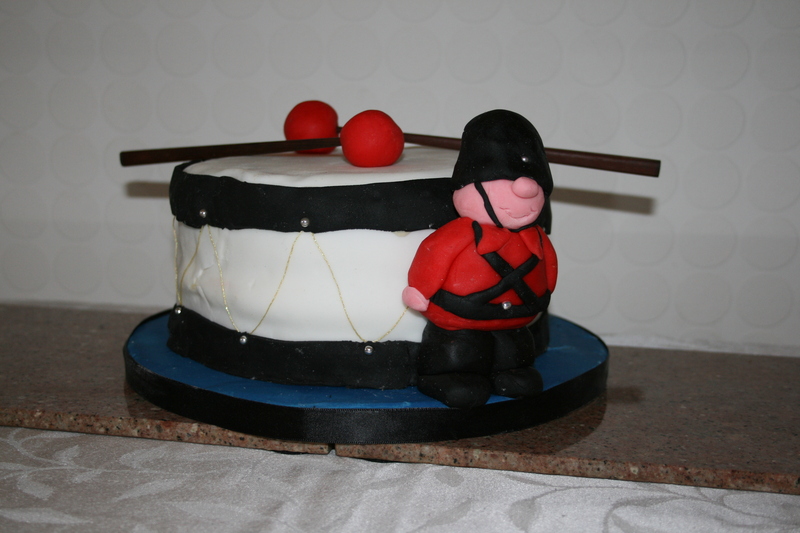 I say that, the only thing they did know was that they didn’t want a fruit cake – eek! We did a few designs and showed them a few pictures from a Wedding cake Magazine. They decided that they wanted 3 tiers piled on top of each other and they wanted a fun. 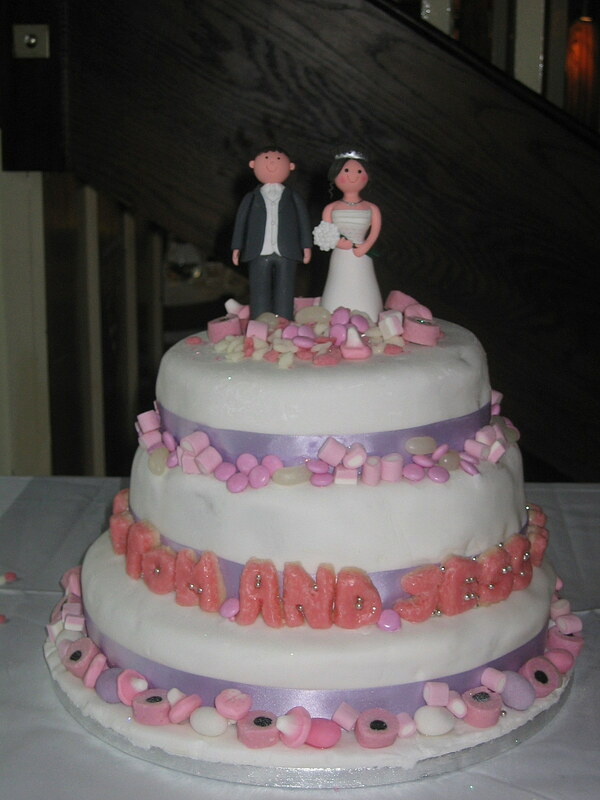 In the end they liked the look of a picture we found of a cake covered in sweets. Well I like a challenge. There is a wonderful sweet shop near me that very kindly got the sweets together for us. The colour scheme of the wedding was lilac but lilac sweets are quite hard to come by so we went with pink and white – with a lilac ribbon to tie it together. Each of us made one tier (a coffee walnut cake; a chocolate cake and a lemon cake). I made the lemon tier which was also the largest. It was only a 12in but there was so much mixture! Half way through I thought a bucket and a big stick may have been wiser than the bowl I had chosen (the largest bowl I had in the house that I usually use for making bread)! One friend told me afterwards that when she makes large quantities of something she uses a large pot from Ikea, which makes more sense than a bucket. Oh well you tend to learn from these experiences. Anyway getting back to the cake. Myself and my friend Fran ended up decorating the cakes on the Friday evening before the Wedding. Because there wasn’t much room to stick the sweets on and so they kept falling off, we decided to put the topper and the sweets on at the last minute at the reception. We used edible glue and stuck the sweets on by putting a layer of glue on the cake them heaping the sweets on, catching the ones that fell off and using them somewhere else (that’s how we achieved the piled look). Finally we added a generous helping of edible glitter and sprinkled some sherbet pips on the table around the cake. I think it looks quite effective. The couple liked it which was the main thing. This is a sneaky look at the cake I made for my boys first birthday 🙂 I have to admit that he had no choice in the matter. Pretty much as soon as I knew I was pregnant, I knew that this would be his first Birthday cake. It’s actually very easy to make. The cake is a Madeira cake which I cut in half and put butter icing in between the two halves (it made it lovely and moist – I do love my butter icing), which is why it’s bulging slightly in the middle lol. I covered it in white icing cut some black to go around the top and bottom (I think if I do it again, I might use black ribbon instead). The drumsticks are two balls of icing on the end of two chop sticks. The little drummer, I made from icing. He went a little wonky so I think next time I might use chop sticks to add a bit of strength. This was my first attempt at using this kind of icing to decorate a cake so any tips would be most appreciated as next year, I have to make something even better! lol.